Because most runs pit the Runner's installed icebreaker programs against the Corporation's installed ice, it is vital that both players understand the functions and subtypes of the Corporation's ice and the Runner's icebreakers. Ice is defensive software the Corporation installs in front of his servers to protect his valuable data. There are four main subtypes that can appear on a piece of ice: sentry, barrier, code gate, and trap. Ice also has separate abilities called subroutines. Subroutines are abilities of a piece of ice marked by the arrow symbol. If the Runner encounters a piece of rezzed ice and does not or cannot break its subroutines, the unbroken subroutines trigger and resolve one by one. In addition to preventing the Runner's access to the Corporation's servers by ending his run, subroutines can pose other hazards if allowed to trigger, such as damaging the Runner or initiating trace attempts. Icebreakers are programs with the icebreaker subtype that the Runner can use to overcome ice encountered during a run. Each icebreaker has a strength, an install cost, and one or more subtypes that reflect which kind of ice subroutine it is designed to break. The Runner uses icebreakers to interact with and break subroutines on ice. An icebreaker can only interact with ice that has equal or lower strength than the icebreaker. In addition to this strength requirement, many icebreaker abilities can only be used to break subroutines on particular subtypes of ice. For example, an icebreaker that has the ability "1 credit: Break barrier subroutine" can only use this ability to break subroutines on a piece of ice with the barrier subtype. It does not matter if the ice has additional subtypes, provided it has any subtypes referred to by the icebreaker's ability. If an ability does not restrict itself to a subtype, it can be used against any piece of ice. Many icebreakers allow the Runner to temporarily increase the icebreaker's strength by spending credits. This helps the Runner deal with stronger pieces of ice, provided he has enough credits to spend. This strength increase lasts only while the current piece of ice is being encountered, unless otherwise noted by card abilities. 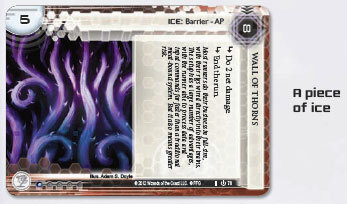 After an encounter with a piece of ice, the icebreaker's strength returns to the value shown on its card. This applies to any other strength modifiers given by icebreakers as well. Runs typically transpire in three phases. Not every run will include all of these phases. Players are encouraged to use the following text in combination with the "Timing Structure of a Run" diagram on page 33 in order to fully understand the intricacies of runs. To initiate a run, the Runner declares the server that he is attacking. 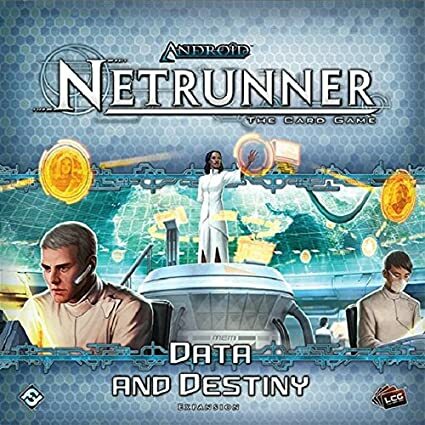 The Runner can only initiate a run against a single server per run action. 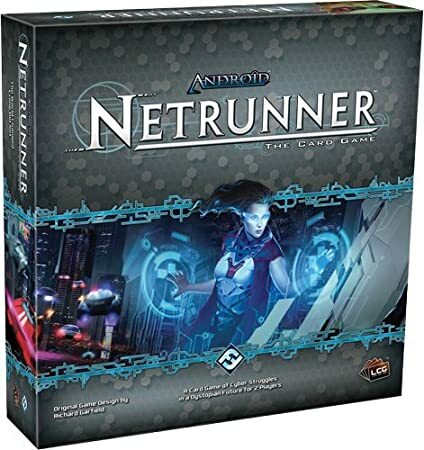 After the Runner declares the server he is attacking, he gains 1 click to spend during the run for each point of bad publicity the Corporation has. Then, both players check to see if there is ice protecting the attacked server. If there is ice protecting the server, the run proceeds to the Confrontation phase. If there is no ice protecting the server, the run proceeds to the Access phase. The Confrontation phase consists of approaching a piece of ice and then potentially encountering that ice. A Runner approaches each piece of ice protecting the server one at a time, starting with the outermost piece. The Runner must pass each piece of ice in order to approach the next piece of ice protecting the server, continuing until all pieces of ice have been passed or until the run ends. If the Runner passes all pieces of ice protecting the attacked server, the run proceeds to the Access phase. When the Runner approaches a piece of ice, he must first decide whether he wishes to continue the run or jack out. If he decides to jack out, he ends his run and the run is considered unsuccessful. The Runner cannot jack out while approaching the first piece of ice during a run. 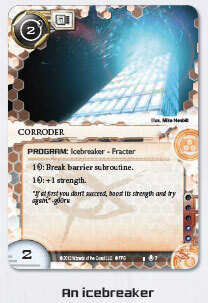 If the Runner decides to continue instead of jacking out, the Corporation has the opportunity to rez the approached piece of ice and any other non-ice cards. Note: The Corporation can only rez ice when it is approached. If the approached piece of ice is rezzed after the Corporation has the opportunity to rez cards, then the Runner encounters it. If after rezzing cards the approached piece of ice is not rezzed, then the Runner passes it. He then continues the run by either approaching the next piece of ice protecting the server or proceeding to the Access phase if there is no more ice to approach. When the Runner encounters a piece of ice, he has the opportunity to break any subroutines on that piece of ice. After the Runner finishes breaking any subroutines that he wishes to break, each unbroken subroutine on that ice triggers in the order as listed on the card. If a subroutine ends the run, then the run ends immediately and no further subroutines on that piece of ice trigger. Breaking Subroutines - To break a subroutine, the Runner uses abilities on his installed icebreakers. The Runner can break the subroutines on the encountered ice in any order he chooses. 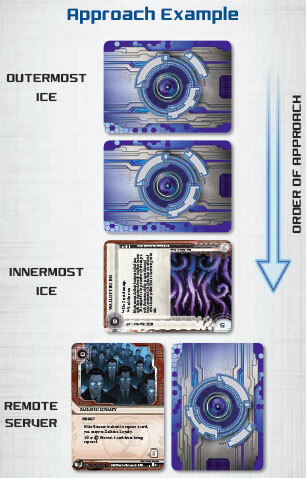 There is no limit to the number of installed cards a Runner can use to interact with the encountered ice, but he generally only needs one icebreaker. Remember that before an icebreaker can interact with a piece of ice, the icebreaker's strength must be equal to or higher than the encountered ice's strength. Note: Breaking all subroutines on a piece of ice does not mean the ice is trashed. A passed piece of ice remains installed and is approached during every subsequent run against the server it protects. After the Runner breaks all of the ice's subroutines and/or any effects from unbroken subroutines resolve without ending the run, he has passed that piece of ice. He then continues the run by either approaching the next piece of ice protecting the server or proceeding to the Access phase if there is no more ice to approach. R&D: The Runner accesses the top card of R&D, and any upgrades in its root. Unless the Runner scores, trashes, or is forced by a card's text to reveal the card, he does not show cards accessed from R&D to the Corporation. HQ: The Runner accesses one random card from HQ and any upgrades in its root. Any cards the Runner does not score or trash return to HQ. Archives: The Runner accesses all cards in Archives and any upgrades in its root. The Runner turns all cards faceup when accessing them, and does not need to keep them in order. The Runner steals all agendas in Archives and cannot trash cards that are already in Archives. After accessing Archives, all cards in Archives return to Archives faceup. Remote Server: The Runner accesses all cards in the server. Note: Installed ice is not in a server and is never accessed. If the Runner accesses an agenda, he steals it and places it faceup in his score area, resolving any conditional abilities on the agenda that use the language "When you steal". While an agenda is in the Runner's score area, it adds its agenda points to his score. The Runner cannot decline to steal agendas he accesses. If the Runner accesses a card with a trash cost, he may pay credits equal to its trash cost in order to trash it to Archives faceup. When accessing multiple cards, the Runner accesses them one at a time in any order he likes. For example, the Runner may access a card from HQ, then an upgrade installed in the root of HQ, and then another card from HQ, if he has the ability to do so. When accessing multiple cards from R&D, the Runner must draw them in order from the top of the deck, and must return any cards not scored or trashed in reverse order, so as to preserve their positions in R&D. The Runner must fully resolve his access to a card (steal it, pay to trash it, etc). before accessing the next card. 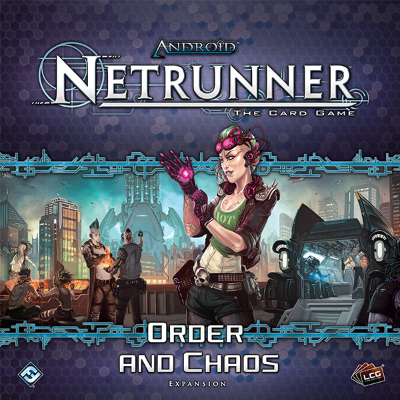 If the Runner scores an agenda that gives him seven or more points, he immediately wins the game, even if he would otherwise access more cards. After the Runner has accessed all required cards, he returns any cards not stolen or trashed to their original play states. For example, an unrezzed card in a remote server returns facedown to that server, and a card accessed from HQ returns to HQ. After a Runner finishes accessing cards, the run ends. The Runner returns any unspent bad publicity credits to the token bank, and the Runner resumes his Action phase.